It's Friday and that means it's FEATURE time! Last week I started this new thing - FRIDAY FEATURES - where every Friday I'll be featuring a vegan product, or brand, or high vibin' person! You can check out our first friday feature here, where I talk about the best store bought vegan ice cream brand. Today's feature is a little different, because I'm including a recipe! YAY! So, let's get to it! 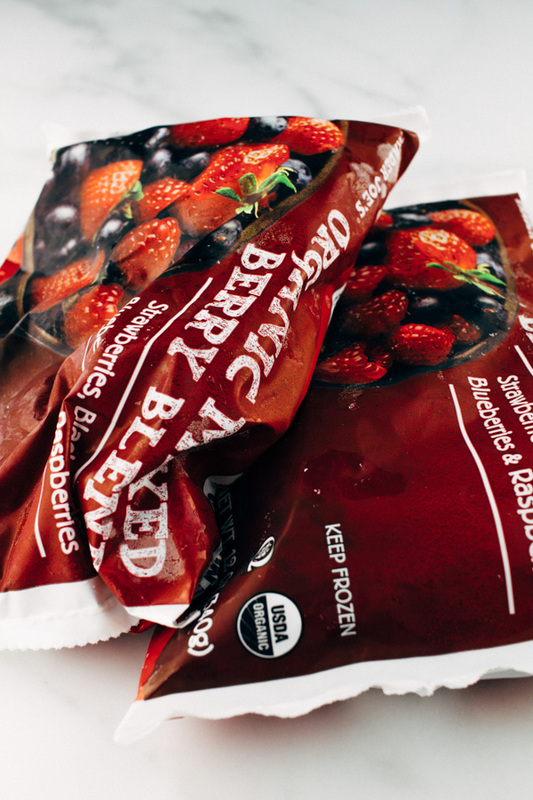 Today I am featuring - Trader Joe's Frozen Fruits! 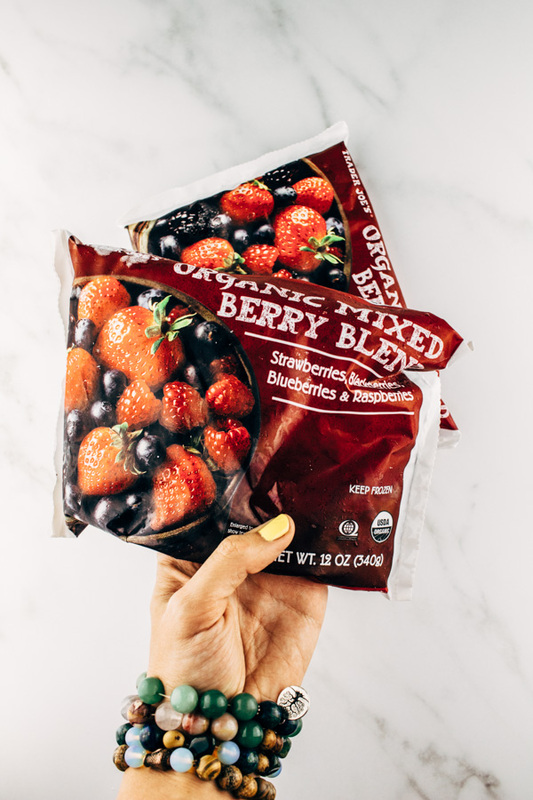 (or any frozen fruit brand in general but since we all love Trader Joe's I decided to show their fruits some love, plus they're pretty affordable 😉 ). Frozen fruits are MUST have for every vegan (okay maybe not a musttt have), but it does make life and meals a lot easier. If you're a beginner vegan and you are wondering what is one thing you should always have in your freezer - this, this is it; FROZEN FRUITS. Sweet tooth? No problem, munch on some frozen fruits. They're super versatile - you can make smoothies, shakes, throw them on your oatmeal. Fruits are GOOD for you, and provide antioxidants and phytonutrients. anddd if you happen to buy this specific Trader Joe's brand - they're pretty affordable. Each organic bag will cost you around $3 per bag, and you can usually get 2 to 3 servings out of each bag. There is a lot of debate on the topic of whether or not fruit sugar (fructose) is good for you or not. I'm not a doctor nor a scientist so I cannot confirm or deny any of those rumors. What I do know is that many plant based doctors, such as Dr. Michael Greger, do advocate for the inclusion of fruits in your diet. There are many studies that have shown that fruit sugar does NOT have the same effect in the body as table sugar does. You can watch this video, If Fructose Is Bad What About Fruit, on Dr. Greger's website which breaks down the comparison between eating table sugar and fruits. The general idea is that fruit has more properties than just table sugar such as antioxidants, fiber and phytonutrients which protect the body and inhibit blood sugar spikes that are so often related with table sugar. The recipe that I am including here today uses these frozen fruits. Of course you don't need the exact brand of fruits, any frozen fruits will do. Even fresh fruits will work, it just won't be as cold. You can try a variety of different smoothies using this one as your base. I included bananas because I like my smoothies on the sweeter side, but if you are looking for something less sweet, feel free to leave the bananas out. You can also make this smoothie using non dairy milk - but for today's recipe I opted to keep it as simple as possible so I used water instead. 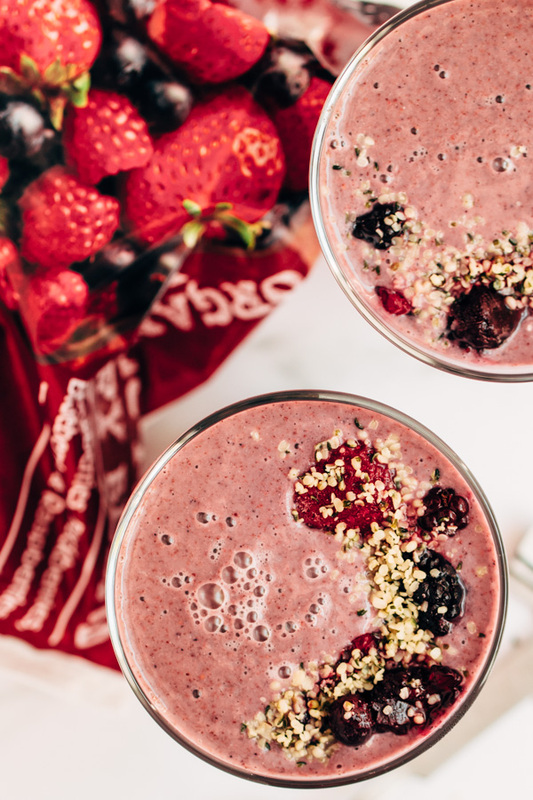 This breakfast smoothie is jam packed with protein thanks to the inclusion of chia seeds and hemp seeds (16g of protein alone from the chia and hemp!). I mention this because if you decide to leave any of these two ingredients out, thennnn it won't have as much protein if that is what you are looking for. Of course you can also use a scoop of your favorite vegan protein powder if you have any on hand. Want more Vegan Breakfast Ideas? 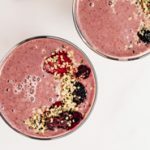 Learn how to make those fancy Acai Bowls at home, or check out this bright Mango Pineapple Breakfast Smoothie or maybe you're in the mood for carrot pineapple juice instead? 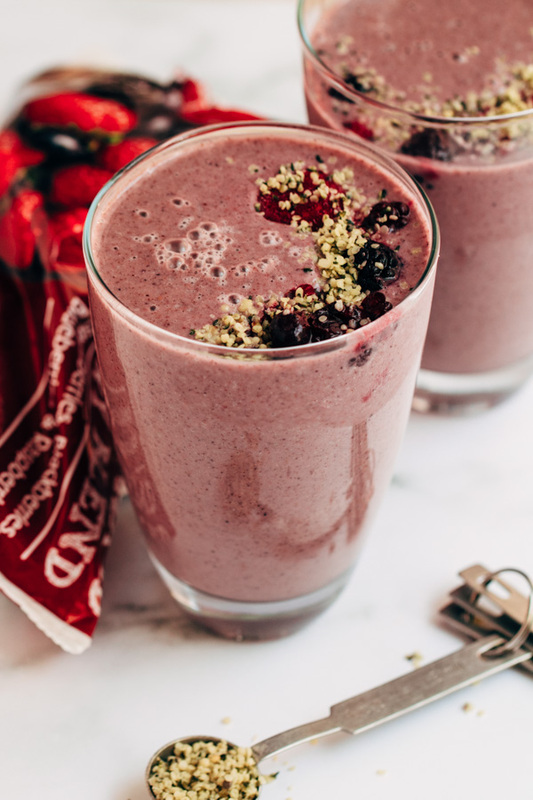 A quick and easy protein packed vegan breakfast berry smoothie. You can make this with non dairy milk or water. Water produces a thinner, less heavy, smoothie consistency. It is also less in calories and not as sweet. If you are looking for something higher in calories, then you can go ahead and make it with non dairy milk. The banana is optional but I found that it wasn’t as sweet with out it. If you like sweetness in your smoothies, you can use bananas or dates. 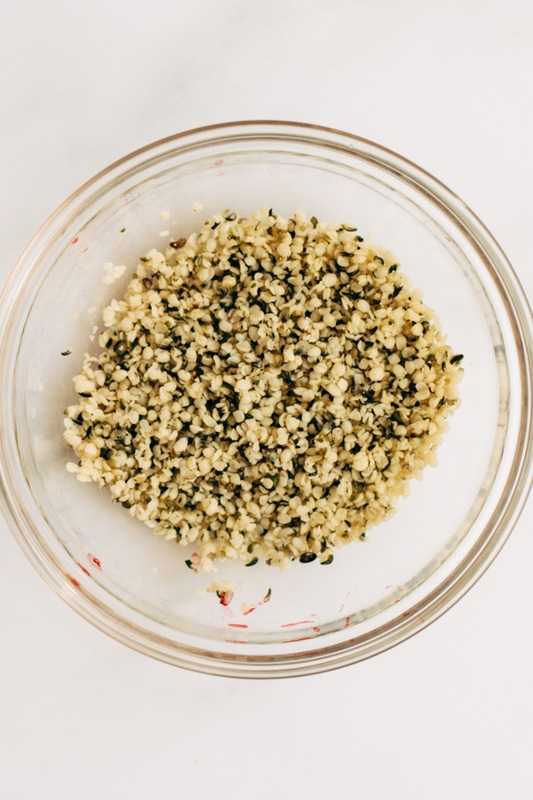 Hemp and chia seeds are what gives this smoothie it’s protein (around 16g) so keep that in mind if you decide to leave one of these ingredients out. The statements expressed within this article have not been approved by the FDA and all opinions expressed are my own. This is not medical advice. Always consult with your professional health care physician regarding any changes in diet.